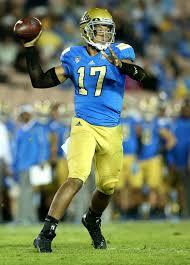 QB Brett Hundley, UCLA 6’ 3” 226 lbs. Cons: This first thing that jumps out while watching the young signal caller is that he is not a very fluid athlete with almost robotic movements. He is a pure shotgun quarterback who does not take snaps under center, if at all. When Hundley is back in the pocket, he sometimes struggles to get the ball out quickly. The signal caller needs to improve on his internal clock and long delivery to keep him from getting sacked. After the pocket starts collapsing, the quarterback can get careless with the football, not tucking it away and getting strip-sacked. Hundley appears to focus too much on the pressure and starts looking down, instead of looking downfield for a possible target. He rarely goes through his full progression and seems to focus on his first or second targets before deciding to run. The quarterback needs to use more bootlegs to cut the field in half which could create passing lanes. He shows varied efforts with play fakes that could slow down defenses. Hundley has a bad habit of throwing the ball without regard to the safety of his receivers, leaving them susceptible to big hits due to his targeting. While his arm strength is very powerful, the signal caller lacks the touch and tends to throw the ball with the same speed if it is five yards or fifty yards away. It seems as though he doesn’t understand what the defense is trying to do and simply tries to use his athleticism to win the game. Pros: He is the second most athletic quarterback in his class after Mariota. When Hundley steps up in the pocket, he makes quick decisions by getting out the ball as soon as possible. The signal caller has a strong throwing base and has a powerful arm that can flick the ball fifty yards on one knee. The quarterback is at his best when he finds his receivers in stride allowing them to use their athleticism. He demonstrates good leadership by putting the team on his shoulders and makes aggressive decisions, sometimes to his team’s detriment. Hundley is quite accurate on the run, but usually elects to run instead. Hopefully his NFL quarterbacks coach or offensive coordinator can assist him with that. Once Hundley makes the choice to run, he shows good balance, bouncy feet, and can make the first defender miss. He has a strong upper body and has an effective stiff-arm to keep defenders away from his legs. The quarterback uses his powerful legs to fight for extra yardage and is a threat to score in goal line situations. His 4.63 forty time is impressive for a signal caller his size, but not elite. He is still a bit on the raw side and will need time to adjust to the NFL. Overall thoughts: Hundley reminds me of a less polished and less physical Cam Newton. While I love his athleticism, the young man has a lot to work on. If he gets pressed to start right away, I’m not sure that he will be able excel. However, if the young quarterback has a strong organization that allows him to sit year one, I think he could develop into an Alex Smith type player. If you enjoy the website, donate using the PayPal button at the bottom of the page. Also, follow me on Twitter @AndrewMiley or the site @Dynasty_Blitz. « Devante Davis: Is he worth a Vegas type gamble? Brett Hundley is basically the same passer as Blake Bortles and is a more dynamic run threat, but will go 30 picks later. Why?